FLORIDA – St. Petersburg, Florida, City Council members recently approved plans to demolish and reconstruct its iconic pier. The new hybrid pier will attract all visitors from boaters and tourists to fishermen and families. The hybrid pier-park is collaboration between of Rogers Partners Architects+Urban Designers, ASD and Ken Smith Landscape Architect. 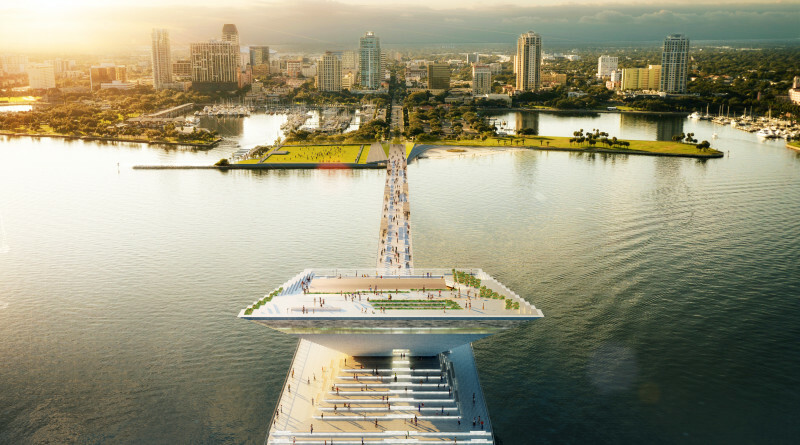 Under the proposal for “Destination St. Pete Pier,” the new facility will feature an expanded beach area, amphitheater, event space, pedestrian swing bridge, transient docks and a restaurant. According to a press release, the pier has a rich history dating back to 1889 when the Orange Belt Railway constructed the “Railroad Pier” as a railway-accessible sightseeing and recreational resort for locals and tourists. Several pier designs followed with the inverted pyramid structure completed in 1973. The pier currently features the inverted-pyramid structure which houses an observation deck and restaurant. But pier designer’s – and city officials – want more for the iconic structure. “Uniting city, sea and sky,” the pyramid will offer breathtaking views of the waterfront on its observation deck, house a bar, restaurant, and education and marine diversity wings. The plan proposes three fishing docks (a total of 340 linear feet, 17,000 square feet) around the pier heard and a bait shop on the first floor of the Pyramid. Fish cleaning tables and stations are also in the plan. A kayak and paddleboat rental area, and docks are also elements of the visitor serving pier that will provide a promenade for walkers and vehicular traffic. A spacious lawn will be available for concerts, festivals and community gatherings. Designated fishing spots, an LED light show and space for boats are all part of the plan for the half-mile-long pier that will connect to the waterfront’s upland area. City Council approved $5.2 million for design and demolition of the current pier.